Boiler and steam systems are frequently the largest use of natural gas in a plant that requires steam for its processes. Boilers are either of fire tube or water tube design. 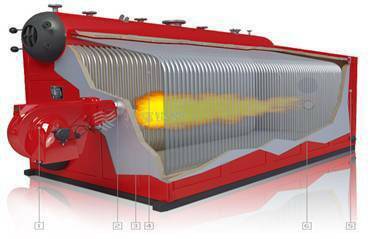 Fire-tube boilers keep burner and combustion products contained in tubes surrounded by the water that will be boiled. These boilers are typically cylindrical pressure vessels containing water/steam. Because the force exerted by the steam on the wall of the cylinder increases as the diameter and pressure increase, these boilers are typically limited to 600 BHP and 200 psi steam. 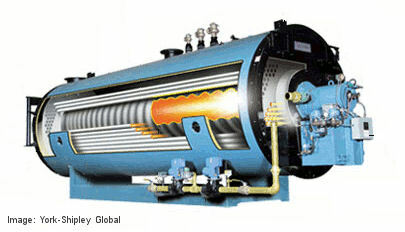 Water-tube boilers have water/steam inside the tubes and flame and combustion products on the outside of the tubes. Since steam is contained in much smaller tubes, significantly higher steam pressures (up to 2,000psia) are possible with water-tube boilers. The following recommendations outline the most common ways to effectively save energy within steam systems. Some of these suggestions involve recovering waste heat, insulating surfaces, and improving combustion efficiency. Exhaust gases inherently carry some of the energy from the combusted fuel up the stack. By minimizing the temperature of the gas exiting the stack, the utilization of the fuel energy is maximized. For boilers, the primary application for waste heat recovery is to preheat boiler feedwater, which is accomplished using a heat exchanger usually referred to as an economizer. For larger boilers, preheating air for combustion is another potential application for this waste heat. In either application, boiler efficiency (or really, fuel utilization efficiency) is increased proportionately with decrease in stack gas temperature. Care must be exercised in reducing stack gas temperature, however, as temperatures below about 250F can result in condensation of water vapor carried in the exhaust gases. A condensing economizer is built of corrosive resistant materials and can allow condensation of water vapor. This does recover a significant amount of additional energy associated with the phase change (condensation) of the water vapor. A particular method to recover waste heat from a boiler is to install a condensing economizer. By installing an economizer, the lost energy from the hot exhaust that leaves the stack can be recovered and used to preheat the incoming boiler feedwater. An economizer is essentially a heat exchanger that transfers heat from the hot flue gas leaving the boiler to the feedwater entering the boiler. Preheating the boiler feedwater will make the boiler more efficient by reducing the energy needed to convert water into steam. Savings associated from this implementation can typically range from 4% to 17%. Boiler surfaces that are exposed to the outside air lose heat to the surrounding areas. This loss of heat energy causes an increase in fuel consumption and can also increase the cooling load if the boiler is located in an air conditioned space. Insulating exposed boiler surfaces will reduce the amount of fuel needed to operate the boiler by maintaining the heat within the boiler and reducing the amount of heat lost to the surroundings. The energy savings from insulating exposed boiler surfaces are low, but the relatively low implementation cost associated with this efficiency improvement project allow for a short payback period. Operating a boiler with an optimum amount of excess air will minimize heat loss up the stack and improve combustion efficiency. Combustion efficiency is a measure of how effectively the heat content of a fuel is transferred into usable heat. The stack temperature and flue gas oxygen (or carbon dioxide) concentrations are primary indicator of combustion efficiency. An often stated rule of thumb is that boiler efficiency can be increased by 1% for each 15% reduction excess air or 40F reduction in stack gas temperature. Depending on the temperature of the exhaust gas and general system inefficiencies, the potential savings can be significant and can offer a quick payback. The following recommendations outline additional ways to save energy consumption for steam systems. These recommendations are sometimes customary to specific facilities, but are still reliable sources for energy savings. Steam leaks cause a large amount of energy to be released to ambient conditions during boiler operation. Repairing steam leaks will reduce energy usage and boiler operating costs. A regular check of the steam system components will detect leaks before they become severe enough to adversely impact natural gas cost or cause mechanical or manufacturing problems. The energy required to produce steam and high pressures is much greater than at lower pressure. Reducing the steam pressure to the lowest optimal level can result in energy savings. Effects of reduced boiler pressure include reduced steam demand, reduced boiler blowdown loss, improved boiler efficiency due to decreased combustion losses, and low fuel consumption. The reduction steam pressure will also reduce the losses from the system associated with heat transfer (because the temperature is lower) and reduce steam leak (because the pressure is lower). However, care should be taken when lowering the pressure of the boiler to ensure it will not create other issues with the system or cause maintenance problems. Savings can vary depending on pressure levels of the system, but implementation costs are usually relatively low. Steam traps are used to remove condensate from steam systems, preventing damage to valves, equipment, piping, etc. The optimal number of steam traps varies depending on plant and boiler size, and the traps must be maintained to prevent them from failing. In an unmaintained system, it is common for 15%-30% of steam traps to have failed. Failed steam traps decrease boiler efficience, waste natural gas, decrease the quality of the steam traps and often increase production cost. Properly maintaining and repairing steam traps is necessary to keep the trap system operating properly. It is a low cost maintenance issue, but the savings potential can range from 1% to 9% of boiler energy input.